"Lastly, I finally got the time and wherewithal to listen to my friend Frank Lamphere’s latest CD. It’s entitled Frank Swings, and it features the vocalist’s five original compositions. If you haven’t heard this Chicagoan crooner before, you’re in for a treat. Unlike singers like Michael Buble who initially succeed in one genre but cross over into more popular styles, Frank demonstrates respect for the style he loves. Without being a generic impersonator, Lamphere derives inspiration from the usual suspects, Sinatra and Dean Martin. But I didn’t find myself comparing him to either. Both his singing and original songs stand on their own merits. His voice, now more than ever before, is a wonderful blend of masculine strength and smooth, rounded edges. Rather than sounding like someone who is hesitant, Frank’s style embodies bridled strength. It’s classy, it’s powerful, but it’s never rude or unkind. It’s refreshing to hear a new offering with the kind of romantic, sincere sentimentality that is almost completely lost in modern music. The fledgling composer succeeds with five originals with catchy lyrics, good production value, and top notch playing by some of Chicago’s finest musicians. Two songs which really stand out are “Chicago is For Me”, a song I could easily hear on TV or in a movie, and “I Like Your Smell.” The latter song’s provocative title lives up to expectations. With tongue firmly in cheek, Frank brings together man’s two perennial loves, food and women. 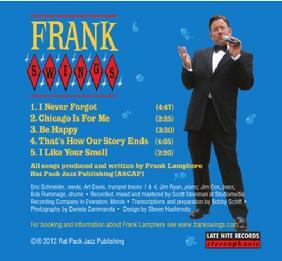 If you have love for the Rat Pack, check out Frank Lamphere’s new CD. If you are in the Chicagoland area, go hear him for yourself. You can buy the CD, see videos, and more at www.frankswings.com"
The Making of "I Never Forgot"
The Making of "Chicago Is For Me"